Back in July 2011 my book “Survive The Coming Storm – The Value of a Preparedness Lifestyle” was published. This book is one of the few “Survival books” written from a biblical and well as practical every day perspective. I did not write that book for all the “Rambo’s” in the world. I wrote it for all the everyday “soccer parents” out there that realized that things are getting grim and that they know they are behind the 8-ball. In the book I put myself and my family in the role of “Guinea Pig” and we lived and used the things that I wrote about in STCS. We are not rich by any means, and in fact we have learned to live a pretty frugal life over the years. God has blessed us with what we have needed and also blessed us from time to time with things we have wanted. There is a difference too. But we were able to prioritize and finally get multiple years of food, medical supplies as well as arms to protect ourselves and our home. Fast forward to today and we are facing yet another possible storm, that storm is called Ebola. Reports are showing that the spread of Ebola is starting to become exponential. In fact, the head of the World Health Organization stated that this outbreak "is moving faster than our efforts to control it". I am not trying to be a fear monger, what I am trying to do is fulfill my job of being a watchman. In the days of high walls and castles, it was the job of the watchman to stand upon the wall and call down into the city what is going on and what he sees approaching the city. He had a vantage point that those in the city did not have. He was able to look out upon the horizon a great distance. He could see far and report on advancements of armies and even storms. If it was within eyesight, the watchman could see it and report on it. God states in scripture the importance of the watchman as well as his responsiblity. That is my job and I try to do my job as good as possible. I try not to be “sensational” like others out there, but also try not to “sugar coat” things so that it is more palatable. 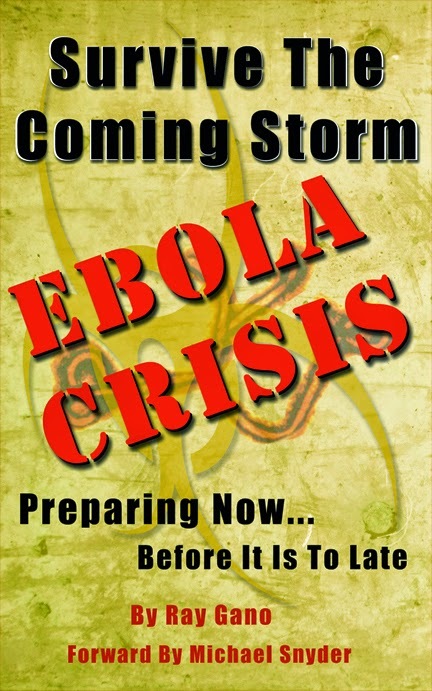 My latest book is going to be titled "Survive The Coming Storm - EBOLA CRISIS"
It is my hope to have it finshed by Aug 8th and push it out to Amazon Kindle. I am going to also try to push it out on iBook and Nook. We will see. Please pray that this book does well and helps people if the situation arises. [Download] $12,234 in 2 months Betting Software? I dont care about sports. Shame on me but I don't even know the baseball rules. I tried everything from forex & stocks to internet marketing and affiliate programs.. I even made some money but then blew it all away when the stock market went south. I think I finally found it. Download Now!